Eisspeedway Journal: Official results - 2018 FIM Long Track World Championship – Final 1 HERXHEIM (GER).10 May 2018. 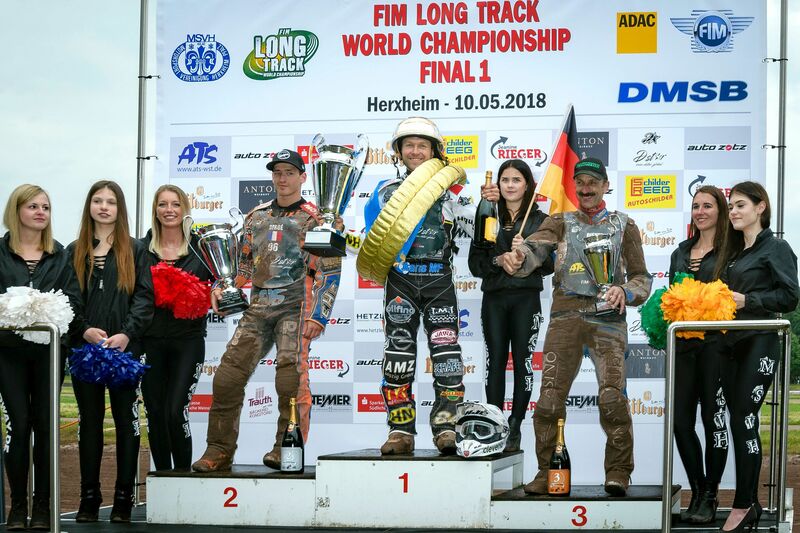 Official results - 2018 FIM Long Track World Championship – Final 1 HERXHEIM (GER).10 May 2018. Heavy morning rain had threatened the meeting and the start was delayed for one hour as the weather improved. Despite this a large crowd was present and although racing was affected by the state of the track during the early stages, there was a distinct improvement as the surface dried out during the afternoon. Smolinski had looked to be the fastest rider on show and without mechanical troubles would have been unbeaten but in his first race a broken chain caused him to retire then in his semi-final his silencer came adrift and he was disqualified. He made no mistake in the final however taking the lead over Dmitri Bergé on the first lap and extending his lead for the rest of the race. Veteran Bernd Diener was third and Finland’s Jesse Mustonen fourth after James Shanes retired with machine problems. Of the top three from 2017, none were able to reach the final on an afternoon of some surprises. The performance of Diener was remarkable for a rider approaching his 59th birthday. He has returned to the championship with renewed enthusiasm and his experience served him well on a track which was sometimes difficult. Dmitri Berge has also returned this year and showed the form which took him to a bronze medal in 2015. His 25 points places him at the top of the leader board. There were disappointments too as current champion Mathieu Trésarrieu looked far from his best although a disqualification for crossing the outer edge did not help his cause. Romano Hummel was expected to mix it with the top riders and looked confident with a fine win in his first race. Then a disqualification for tape breaking and an engine failure saw his points haul limited to seven and he failed to reach the semi-final stage. In an afternoon of mixed fortunes for the Germans, Stephan Katt was a shadow of the rider we expect and managed only three points including a disqualification after falling in a close battle with Mustonen. Young Michael Härtel was clearly struggling with a recent collarbone injury collected in a speedway accident and, despite having been the second fastest in practice, did not manage a heat win. The British riders also experienced only limited success. Chris Harris faded after a promising start, but Richard Hall recovered from poor beginnings to achieve a top ten finish and only James Shanes lived up to his reputation with a hard earned 17 points. With four finals still to race there will be opportunities for fortunes to change before the climax of the series at the end of September. Consistency will be the watchword and riders will be aware of this as they reflect on the results of this first meeting.